As Argmon entered in the course corrections to take the SS Acid Rat near the black holes, June helped Joey sit in Vic’s seat. June pressed her fingers to his lips. She was already having a difficult time dealing with everything around them, she didn’t want any words from Joey to confuse things. She kissed him on the forehead and left to go check on Vic. How did everything get so messed up? If that police cruiser hadn’t followed them out of Bamda, and Vic hadn’t taken on this stupid challenge, and Mike hadn’t been in cahoots with someone he called the ‘boss’, none of this would be happening. Could someone really have planned for all this to happen? Could the person Mike contacted be orchestrating all this? No. Even if they planned for months and months they couldn’t have expected all these events to fall into place so well. No one could possibly plan anything that well and arrange for all the contingencies. June entered the captain’s sleeping quarters. Vic had never kept anyone from sleeping in this room if they wanted to. He held a loose, almost flippant attitude when it came to formalities. He only expected for his orders to be obeyed. Beyond that, the crew had extreme liberty to do what they felt best. She and Joey had challenged Vic and they hadn’t done so lightly. They had taken away any little bit of self esteem he might have had left after getting bitten by Mike. It was now her responsibility to talk to Vic and boost him back up. She’d only seen him sulk once before and he could be a stubborn one. “Vic?” she asked softly as she entered the darkened Captain’s quarters. Vic had made the walls semi-transparent. He apparently wanted to watch the trip around the black holes. June hoped that boded well for this conversation. He didn’t answer. Instead he lay on the bed with his back to the door. She could feel that he wasn’t sleeping. June pressed a button on the wall and a padded shelf slid out of the wall next to the bed. She sat and put her hand on Vic’s shoulder. He winced in pain. “I need to check those bandages and change them before they dry and we have to rip them off of you.” At least that sounded like a good excuse for her being there. June opened her mouth to respond with a snippy tone, but that’s not what she was here to do. She came to build Vic’s confidence back up, not tear him down further. Instead she put her hand on his head. He was burning up. “Have you seen what the gravitational forces of a black hole can do to a planet let alone a little ship like this?” Vic coughed from outburst. That set June back. Vic had never been so upfront before. He’d get defensive or sarcastic, but this, this was new. “Take your shirt off. I need to check your bandages.” At least that would give her time to process what had just transpired. Vic and thinking weren’t two things that always went together well. Vic coughed again and struggled to get out of his shirt. The bandages, soaked with blood and poison, definitely needed changing. June steeled herself for the task. The Doctor had shown her what to do, but that didn’t make the task any easier. She’d stored fresh bandages in the drawer nearest the bed guessing that Vic would choose this room to rest in. He didn’t know it, but she knew he liked to be in this room and look outside. “It’s all my fault,” he said abruptly. The smell from the removed bandages was rank with infection. The doctor had given Vic a shot, but the wounds still oozed badly. She dropped the bloody mess onto the floor. SPX-39 could clean it up later. Damn! The robot wasn’t going to do anything. “Taking what so hard?” Vic looked up. Without another word, June finished dressing Vic’s wounds, put a fresh shirt on him, and helped him lay back down. Vic grunted and fell silent. She turned off the light. Joey and Argmon had the cockpit and she watched how Joey leaned away from the four-armed pilot. -Another dream I won’t see happen. I was so close, but I’m going to have to let this one go too. She turned and looked back at Vic lying on the bed. His breathing had grown irregular and he looked so helpless. Fighting back tears, she started to tear the pamphlet into little pieces. She’d never have to tell Vic what the little appointment back on Munchkada had been about. Something caught her eye. Just through the semi-transparent hull stars blinked and came back into focus, but did so rapidly as if… as if? 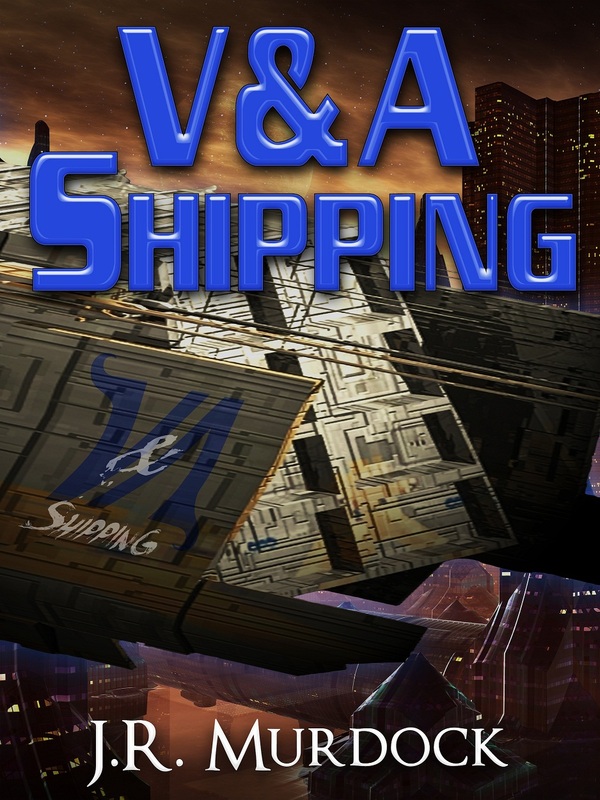 Posted on March 6, 2013, in V&A Shipping and tagged chapter, read along, v&A shipping. Bookmark the permalink. Leave a comment.